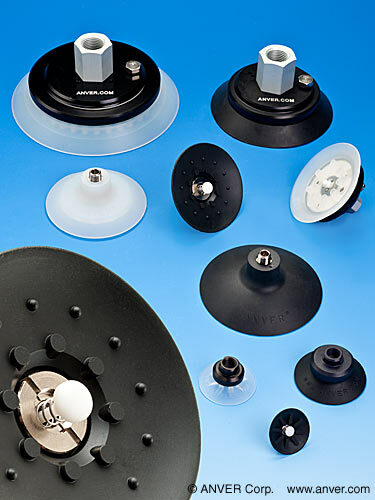 A line of vacuum suction cups featuring button probe valves which only open when a cup touches a load to provide faster attach-and-release, while preventing air loss, is available from ANVER Corp. of Hudson, Massachusetts. ANVER’s Vacuum Probe Cups feature button probe valves which remain closed to save air and energy and are actuated when they touch the load, providing faster attach-and-release than conventional cups. Ideally suited for large pick-up arrays used in high cycle automation equipment, they prevent leakage caused by suction cups that missed the load or are not being used. Maintaining vacuum right at the pick-up point, ANVER’s Vacuum Probe Cups are designed for continuous duty. The Delrin® button probe protrudes slightly from the center, is spring-loaded to remain closed, and opens instantly when it touches a load to permit vacuum flow. Applications include packaging lines that pick-up multiple products simultaneously.